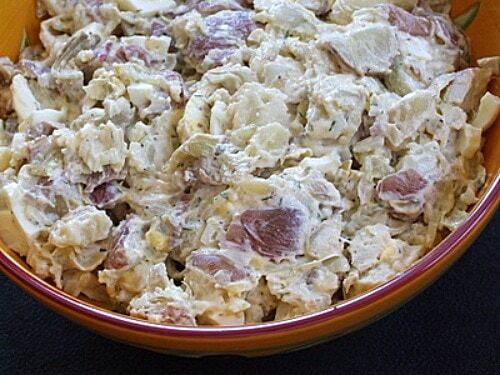 This is a really different potato salad. Love the added marinated artichoke hearts. No extra salt needed. You won't need all of the dressing so be careful not to dump the whole thing in. 1. Combine potatoes and salt with enough water to cover in a saucepan and cover. Bring to a boil for 20 minutes or until tender; drain. Cool slightly and cut into bite-sized pieces. 2. 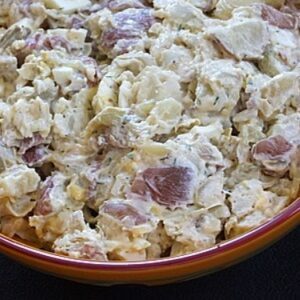 Prepare dressing: Combine mayo, vinegar, mustard, lemon pepper and dill in a bowl and mix well. 3. Place potatoes into a large bowl. Add dressing a little at a time and gently toss with potatoes until you reach desired consistency. Fold in artichokes, onion, eggs and pickle into salad. Chill, covered, for 4 to 24 hours. Stir gently before serving. *Light mayonnaise works just fine in this recipe.